International Beer News: THERE'S FRESH. AND THEN THERE'S REALLY FRESH. I've sampled a lot of beers this summer, but one that really stood out is the Indigo Imp Blonde Bombshell that I picked up at the high-end market in town. It was smooth, very rich and clearly had the nose of a bottle-conditioned beer. But what struck me the most was the bright, yeasty- flavor that brought back some great memories. Over 25 years ago, my wife and and I couldn't really afford much of a honeymoon, so we spent a weekend in Frankenmuth, Michigan - a great little town (cough-tourist trap) that offers some great places to visit and some great food. At the time, they had a Carling Black Label brewery in town, we went on a tour and the fresh Black Label in the hospitality room was actually pretty good. Also in town was the little Frankenmuth Brewery, which offered two kinds of beer--regular pale lager and a dark beer. I purchased a six-pack of the lager and took it back to Ohio with us. It was good, but what I remember most was the incredible, fresh, yeasty flavor--with which I was not familiar at all, and not found in any other beer I'd had at the time (this was 1983, after all). At the time, I later discovered that the strange, fruity taste I was experiencing was due to the still-active yeasts in the brew; I wasn't sure it was something I preferred, but it was a memorable taste, nonetheless. That original Frankenmuth brewery is no more - it's been replaced by a new version, with much more sophisticated and higher-quality beers. 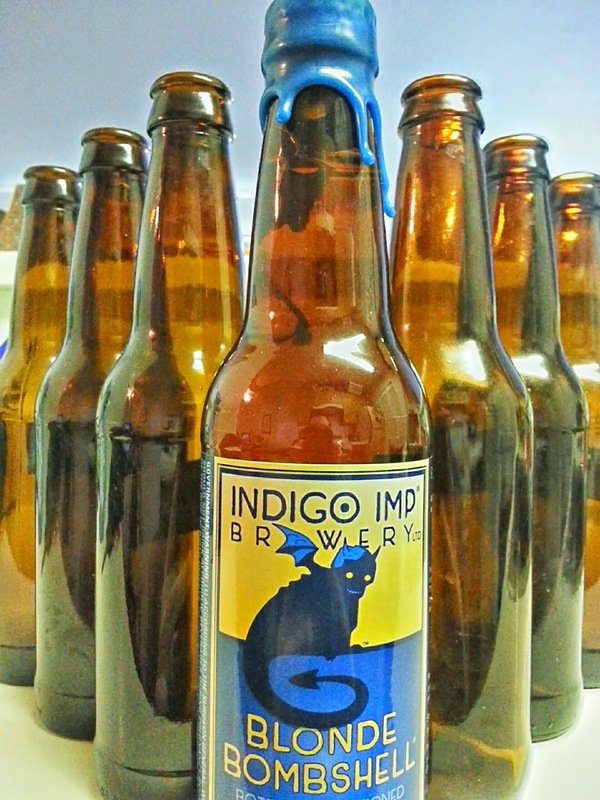 But the yeasty brightness of this Indigo Imp bombshell brought it readily to mind. I still have my wax-sealed "imp" bottle in the fridge - I have a feeling it will possibly improve with a month or more of aging - if I can resist drinking it a little longer.